Council's Science Review Panel Questions Hatchery Supplementation Effectiveness In Lower Snake Posted on Friday, June 17, 2011 (PST) Conservation objectives spawned in the 1990s because of diminished Snake River spring/summer chinook numbers can help ward off species extinction. But using the tool of hatchery supplementation might not work in the long run to rebuild populations, warns the Independent Scientific Review Panel in a May 27 "retrospective report." The new ISRP review is an evaluation of hatchery managers' self-assessment of Lower Snake Compensation Plan spring chinook program performance against the LSRCP goals and Columbia River Basin Fish and Wildlife Program artificial production principles. The ISRP review is based on summary oral presentations, annual reports, and agency and tribal program reports prepared for the spring chinook symposium held in November 2010. "Overall, the performance and practices within the hatchery were acceptable and met stated goals," the ISRP said. But happenings outside the six program hatcheries need attention. Conclusion 1-- Smolt-to-adult-survival and smolt-to-adult returns and overall mitigation goals and assumptions overly optimistic. The ISRP recommends that an ecologically-based approach is needed to develop guidance on realistic harvest mitigation. Conclusion 2b. -- Supplementation not yielding an increase in natural returns: The ISRP recommends that action be taken to establish natural populations that are viable. "We're being a little firmer [than the managers] with our conclusions about whether supplementation is going to get you where you're going," ISRP Chair Eric Loudenslager told the Northwest Power and Conservation Council during its June 7 meeting in Whitefish, Mont. Supplementation is the practice of acclimating young hatchery fish at streamside before their release with the hope that they will return to those sites as adults to spawn in the wild. "Can you use hatcheries to prevent extinction? Yes," Loudenslager said. "But that doesn't mean you won't lose the population in the wild." "There was no evidence presented that supplementation was increasing the abundance of natural origin fish," he said in referencing an assessment of supplementation in northeast Oregon's Imnaha River using a Before/After Control Impact analysis of the abundance of natural origin returns. It indicated that, when contrasted to nine unsupplemented reference locations, the Imnaha River spring chinook showed decreased natural origin return abundance post-supplementation relative to five reference sites, and increased abundance post-supplementation relative to four reference sites. "The BACI analysis found that productivity (recruits per spawner) in the Imnaha River had decreased relative to all nine unsupplemented sites. The ISRP recommends that the BACI method (or alternatives of similar statistical validity) be used at all locations that have programs that plan to use returning hatchery fish to spawn in the streams," the report said. "That's a major conclusion that the region will struggle to deal with," says the report. "That calls into question whether or not to use hatcheries as a recovery tool." The wild portions of 13 Columbia-Snake River salmon and steelhead stocks are protected under the Endangered Species Act. "A final conclusion on the effect of the program on natural adult abundance and productivity is not provided," the ISRP said of the Imnaha program assessment. "Arriving at reasonable inference on the program's effects on these vital statistics is an important next step. This information would contribute to evaluating the program's effect on the viability of the natural population. 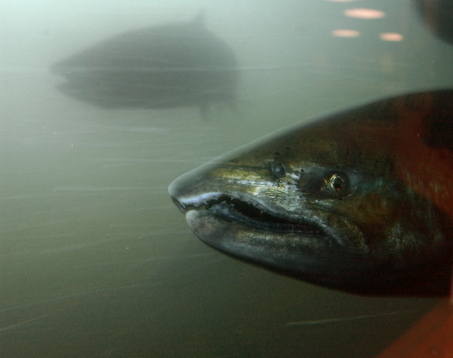 The results that are presented are not encouraging and do not appear to provide empirical justification for expanded supplementation of spring Chinook." ". . . the analysis to date also reveals that the supplementation efforts have not resulted in an increase in abundance of natural spawners. This is cause for concern about the prognosis of the entire supplementation strategy. "Although several causes for the failure of the hatchery program to have been hypothesized, the specific causes remain unidentified for this system. Until these causes are identified, the prognosis for the program meeting LSRCP objectives is not good," the ISRP says. In 2010, the Northwest Power and Conservation Council, in cooperation with the U.S. Fish and Wildlife Service, requested that the ISRP conduct a review of the Spring Chinook Hatchery Program of the LLSRCP. The LSRCP was authorized by Congress in 1976 to conduct fish hatchery operations to produce a return of 58,700 adult spring/summer chinook salmon above Lower Granite Dam after providing 234,800 adults to fisheries in the ocean and Columbia River to replace fish lost by the construction and operation of four hydroelectric dams on the lower Snake River. Spring chinook for the LSRCP are reared at six hatcheries: Lookingglass (upper Grande Ronde River, Catherine Creek, Lostine River, and Imnaha programs), Lyons Ferry (Tucannon River program), Clearwater, Dworshak, McCall (South Fork Salmon River program), and Sawtooth (upper Salmon River and Yankee Fork programs) and acclimated and released at several other satellite facilities. The USFWS owns these hatcheries and administers the program. State, federal, and tribal fish and wildlife agencies in the region operate the facilities and evaluate program success. The ISRP was created by the 1996 amendment to the 1980 Northwest Power Act and instructed by the Congress to review projects proposed for funding by the Council through BPA's fish and wildlife budget. In 1998 the Senate-House Conference Report for the fiscal year 1999 Energy and Water Development Appropriations bill expanded the ISRP responsibilities to include review of projects in federal agency budgets that are reimbursed by BPA, using the same criteria as projects in the Council's Fish and Wildlife Program. The LSRCP is a BPA-funded reimbursable program. Ahead for the ISRP are reviews the LSRCP steelhead program in winter 2011/2012 and the fall chinook program in 2012/2013. Authors: Mark Chilcote of NOAA Fisheries and Ken Goodson and Matt Falcy of the Oregon Department of Fish and Wildlife.